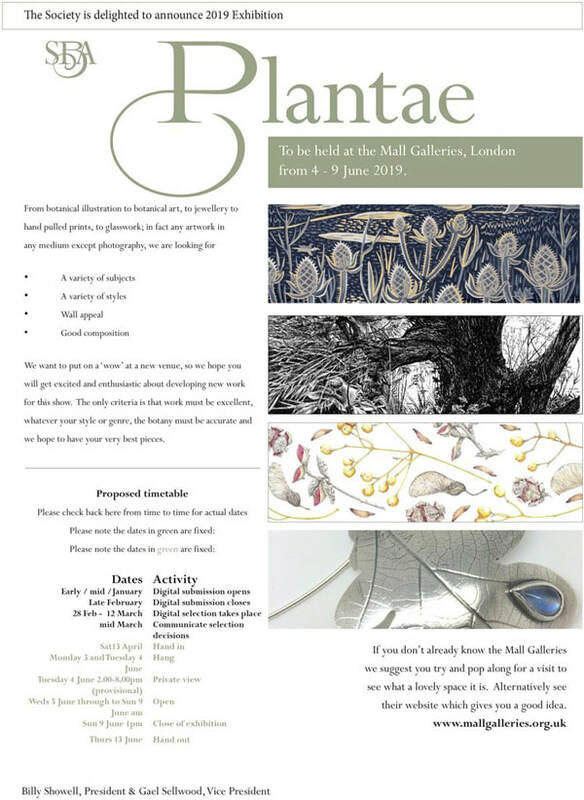 Find out about botanical art exhibitions in England and Wales via the efforts of botanical art societies, groups and individual artists. offer signature status to members meeting specific standards of excellence. The banner image at the top comes from the 2017 Annual Exhibition of the Society of Botanical Artists. There is no annual exhibition in 2018. The annual exhibition will resume in June 2019 at a new venue. Tulipa Tulipae - 20 March - 20 May Madrid Botanical Gardens, Spain - this is a collaboration between the SBA, the Real (Royal) Botanical Gardens in Madrid and the Museo Nacional de Artes Decorativas. A new and prestigious venue - and a much shorter time period - for the annual exhibition. ​Cann for Entries details to be formally issued later. Submissions will open in January. The Association of British Botanical Artists was formed to organise the Botanical Art Worldwide Exhibition for England and Wales. It's is currently reconfiguring its purpose and website. Any future notices about exhibitions will be posted here. Florilegium Societies are typically comprised of professional or semi-professional botanical artists. ​Exhibitions will be listed here as an when I become aware of them. Local botanical art societies very often emerge if there is active teaching of botanical art and illustration in an area. Students learn, then want to exhibit and before you know it another society of botanical artists has been formed. After a number of years of being unable to find a suitable place BSBA have found and booked a new venue for an exhibition in 2018. An East Anglian based group of Artists specializing in depicting the world of plants in all mediums with a majority favouring Watercolour. The membership includes several nationally distinguished, award winning, leading artists in this field who exhibit extensively. In 2014 the group worked on a three year “Breaking New Ground” Heritage Lottery Grant Funded Project teaching the painting of the beautiful and rare flora and fauna of ‘Breckland’ in locally held workshops. Later inspired by this IBA members produced of 45 plant portraits of the rare and endangered wild flowers of the Breckland area which were then exhibited at the prestigious Royal Horticultural Societies Botanical Art Exhibition in London together with a local tour. it may not necessarily have a formal membership scheme. Members may be professional artists, semi-professional or amateur artists. Plants Portrayed will take up two rooms of the gallery, side-by-side with another exhibition: For the Time Being. A selection of 34 contemporary botanical illustrations from artists working at the Royal Botanic Gardens, Kew. Admission: Normal garden admission applies. Free admission for Friends of Easton Walled Gardens. Dawn Wright, SBA Fellow: the resident botanical art tutor at Easton Walled Gardens. Her work has received ’highly commended’ for the Joyce Cuming Award at The Society of Botanical Artists’ Annual Exhibition. 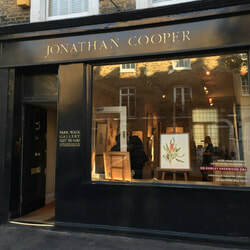 The only galleries listed below are reputable galleries with a history of exhibiting botanical art. New galleries may be shown - but this depends on who the artist(s) are. 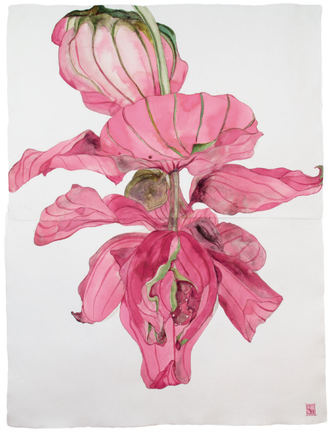 The exhibition will comprise coloured ink drawings and black and white graphites on the theme of the medinilla flower, the subject of Graham’s focus over the past year. Graham works across several sheets of handmade paper to construct these larger-than-life organic forms. The gallery will produce an exhibition catalogue with a scholarly essay to accompany the show. Dates: 28 September-7 October, daily 10-5.
the 800th anniversary of the Forest Charter (1217AD). 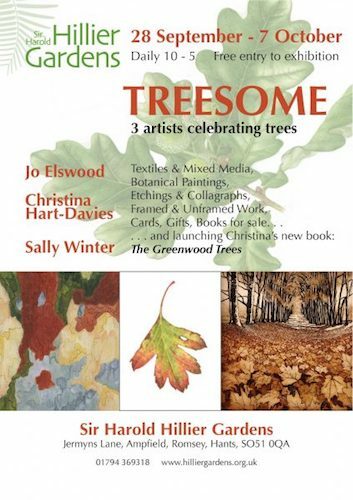 All three artists have produced works in celebration of trees and woods. The latest exhibitor in the Coach House Gallery is botanical artist Jane Edwards. Jane creates fine, accurate drawings of plants and trees resulting from her experience as a botanical illustrator and founder member of the Birmingham Society of Botanical Artists. Gael's exhibition includes some of the 150 paintings included her new book 'The Measure of the Year - Seasons in an Artist's Garden' - which will be launched at the exhibition. 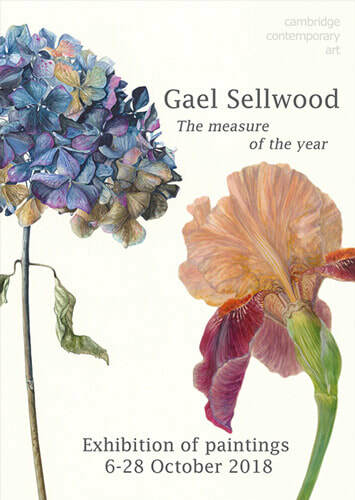 The book is organised by season and takes us through Gael's year in her garden and as a botanical artist. Hardback, 144 pages and limited to just 1,500 copies. 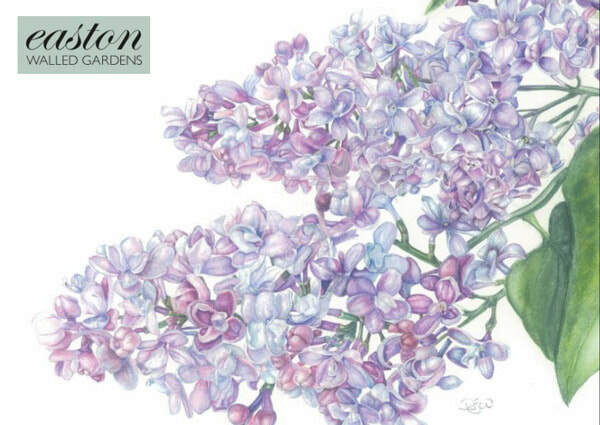 Do you know about a Botanical Art Exhibition in the UK? ANYBODY can help keep the information on the exhibition pages of this website up to date. If you send me images of an exhibition once it is hung, I will try and do a blog post sharing what it looks like with others. This is often a great way of generating interest and visitors.